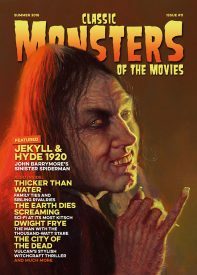 Classic Monsters of the Movies issue 11 is another exciting and vibrant journey into the world of classic movie monsters. Presented with the passion and finesse you’ve come to expect from Classic Monsters, this beautiful full colour publication is absolutely packed with stunning stills and posters to accompany articles by all your favourite writers covering every corner of the classic horror universe. This issue, our cover story examines the 1920 retelling of Dr Jekyll & Mr Hyde starring John Barrymore in the twin title roles. This silent masterpiece is regarded by many as one of the eeriest cinematic versions of Robert Louis Stevenson’s world famous novella, and we explore the reasons why. Daniel Horne’s exemplary painting of Barrymore as the spider-like Hyde is featured on the front cover in glorious Monstercolor! 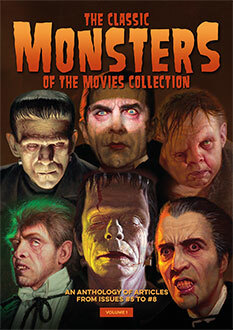 But that’s just for starters, as Classic Monsters of the Movies #11 has plenty more surprises in store. This issue sees the concluding part of our definitive and in-depth feature on the making of Michael Reeves’ 1968 cult classic Witchfinder General, as well as 1960’s oft-overlooked but hugely atmospheric thriller City of the Dead. Elsewhere, there’s a biography of Dwight Frye, whose appearances in movies like Dracula and Frankenstein in 1931 showed a gift for intensely entertaining performances, thanks in part to that famed stare. We also take a look at the complexities of family ties, jealousies and rivalries within monster families, and dodge those lethal robots with a profile of 1964 kitsch sci-fi classic The Earth Dies Screaming. Whichever monster you love the most, the combination of beautiful design, stunning stills and top-flight journalism in Classic Monsters of the Movies #11 is sure to keep you reading. Dr Jekyll & Mr Hyde – John Barrymore turned the wicked alter ego of Stevenson’s scientist into a truly unsettling antagonist in a movie packed with shocks – join us in taking a fresh look at one of silent cinema’s greatest thrillers. Witchfinder General – our fact-packed exploration of this unflinching movie concludes with a close look at how director Michael Reeves commanded the respect of horror legend Vincent Price, as well as creating a classic of the folk horror genre. Dwight Frye – his roles as the deranged Renfield in Dracula and sadistic hunchback Fritz in Frankenstein showed only a fraction of what this skilled actor could achieve. Our biography details his life, career, and tragic death. The City of the Dead – considered by many to be the first Amicus horror movie, this 1960 chiller doesn’t get anywhere near enough attention. It’s time to check into the Horror Hotel and discover its bewitching attractions. The Earth Dies Screaming – a subtle title, yes, and there are plenty of reasons to scream as the planet is invaded by aliens on a mission in this stylishly claustrophobic tale of survival. 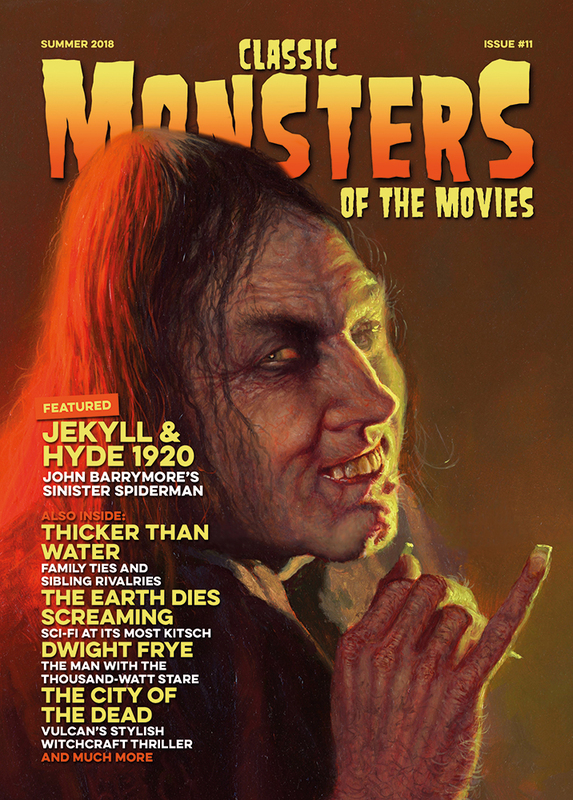 Issue 11 of Classic Monsters of the Movies is the perfect addition to your horror collection, packed with vivid full colour imagery and timeless journalism, designed and printed to a breathtaking standard that has the world talking. Whether you’re a classic monster kid of yore, or are new to the genre, this is a classic horror movie magazine you won’t want to miss. With stunning articles and features from the leading lights in the world of horror magazine publishing, it allows our love of yesteryear’s horror film treasures to shine bright. You’ll soon discover why CMotM is fast becoming the world’s favourite monster movie magazine. Thank you VERY much for giving my all time favorite 60s black & white movie, The City of the Dead, the Classic Monsters treatment! I can’t thank you enough. Very pleased indeed. Tearing it up, it is so good. Your writers are the best, you really get to the heart of the topic.